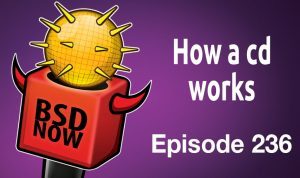 We’ll cover OpenBSD’s defensive approach to OS security, help you Understanding Syscall Conventions for Different Platforms, Mishandling SMTP Sender Verification, how the cd command works & the LUA boot loader coming to FreeBSD. The meaning of Pledge is same as in the real world, that is, “a solemn promise or undertaking”. So, in OpenBSD: Calling pledge in a program means to promise that the program will only use certain resources. How does it make a program more secure? It limits the operation of a program. Example: You wrote a program named ‘abc’ that only needed the stdio to just print something to stdout. You added pledge to use only stdio and nothing else. Then, a malicious user found out that there is a vulnerability in your program which one can exploit and get into shell (or root shell). Exploiting your program to open a shell (or root shell) will result in the kernel killing the process with SIGABRT (which cannot be caught/ignored) and will generate a log (which you can find with dmesg). This happens because before executing other codes of your program, the code first pledges not to use anything other than stdio promise/operations. But, opening a shell or root shell will call several other system-calls which are distributed in lots of other promises like “stdio”, “proc”, “exec” etc. They are all forbidden because the program has already promised not to use any promises other than stdio. Pledge is not a system call filter. So, it is not used to restrict system calls. Pledge works on stdio, dns, inet, etc. promises but not directly on system calls like read, write, etc. And, unique functionality of pledge() is that it works on behavioral approach not just like 1:1 approach with the system calls. This will probably be committed in the next day or so. will gets activated after execve. risks of exploitation become high. Not long ago I started looking into FreeBSD kernel exploitation. There are only a few resources but probably the best starting point is argp’s Phrack article from 2009. And while he does only provide one technique, I wanted to understand it and port it to a modern FreeBSD release before describing new, own researched techniques. else to read. Moreover, some of the debugging stuff can look laborious because I wanted to show the steps I have done while attacking my problem instead of showing a simple walkthrough to the solution. FreeBSD 11.1-RELEASE. Moreover it was written for an Intel 32bit processor architecture as we can see from his shellcode examples. Hence, I wanted to go right away the harder way and modify it to work on an 64bit processor. As written above, the syscall convention for the 32bit architecture is different from the one for the 64bit architecture. Indeed, a syscall on a 32bit FreeBSD system passes the arguments via the stack while the syscall offset is stored in the EAX register. The transfer into the kernel address space is done in ‘cpu_fetch_syscall_args’ in ‘sys/i386/i386/trap.c’. To bring this to an end: argp’s version only worked for his special choice of arguments and only on 32bit. On 32bit FreeBSD platforms the arguments are transferred into kernel space by 4 byte integers, hence it will only work for integers anyway. On 64bit FreeBSD platforms we have to use syscall(2) in the intended way. Yes, that’s right, they sent their spam to root@. And a quick peek at the headers revealed that like most of those attempts at hawking address lists for spamming that actually make it to a mailbox here, this one had been sent by an outlook.com customer. The problem with spam delivered via outlook.com is that you can’t usefully blacklist the sending server, since the largish chunk of the world that uses some sort of Microsoft hosted email solution (Office365 and its ilk) have their usually legitimate mail delivered via the very same infrastructure. And since outlook.com is one of the mail providers that doesn’t play well with greylisting (it spreads its retries across no less than 81 subnets (the output of ‘echo outlook.com | doas smtpctl spf walk’ is preserved here), it’s fairly common practice to just whitelist all those networks and avoid the hassle of lost or delayed mail to and from Microsoft customers. I was going to just ignore this message too, but we’ve seen an increasing number of spammy outfits taking advantage of outlook.com’s seeming right of way to innocent third parties’ mail boxes. I hope they fix that, and soon. And then move on to terminating their spamming customers’ contracts. Otherwise you may end up receiving more of the mail you don’t want than what you do want, and your own mail may end up not being delivered as intended. With these said, I started playing with Salt, and it was simple and straightforward. First step – install Salt: pkg_add salt. This will bring several ports for Python futures, ZeroMQ, or Tornado which are needed for Salt. for other reasons, and found the time was ripe to start integrating this into the tree. However, those integration efforts have taken a while as my day-job work on the boot loader took priority. In the mean time, Ed Maste and the FreeBSD Foundation funded Zakary Nafziger to enhance the original GSoC Lua scripts to bring it closer to parity with the evolution of the FORTH menu system since the GSoC project started. and I didn’t want to delay pushing this into the tree for that. /boot/loader that is scripted with FORTH to one that’s scripted with Lua. goes wrong. I’ve tested it extensively, though, with userboot.so and it’s test program, so all the initial kinks of finding the lua scripts, etc have been worked out. simple path to back out). Since there’s not been full convergence testing, you’ll almost certainly find bumps in this system. Also, all the build-system APIs are likely not yet final. I put MFC after a month on the commit. Due to the heroic (dare I say almost crazy) work of Kyle Evans on merging all the revs from -current to 11, I’m planning a MFC to 11 after the co-existence issues are hammered out. In 11, FORTH will be the default, and Lua will be built by default, but users will have to do something to use it. 12, both FORTH and Lua will be built and installed, with Lua as default (barring unforeseen complications). Once the co-existence stuff goes in, I imagine we’ll make the switch to Lua by default shortly after that. In 13, FORTH will be removed unless there’s a really really compelling case made to keep it. So please give it a spin and give me any feedback, documentation updates and/or bug fixes. I’m especially interested in reviews from people that have embedded Lua in other projects or experts in Lua that can improve the robustness of the menu code. Bitcoin is a valuable popular open-source cryptocurrency that was invented by Satoshi Nakamoto in 2009. Bitcoins have value because they possess same characteristics like money (durability, portability, fungibility, scarcity, divisibility, and recognizability), but based on the properties of mathematics rather than on physical properties (like gold and silver) or trust in central authorities (like fiat currencies). In short, Bitcoin is backed by mathematics. Bitcoin is the first decentralized peer-to-peer cryptocurrency that is controlled by its users. Transactions take place directly between users, and are later verified by network nodes with digital signature and then placed in a public distributed ledger called a blockchain. Bitcoin is unique in that only 21 million bitcoins will ever be created. The unit of the bitcoin system is bitcoin or mBTC. A wallet is nothing more than a pair of public and private keys that are created by a client to store the digital credentials for your bitcoin. A token wallet is the safest way to work with bitcoin network, but you can use your mobile or pc as a bitcoin wallet. A blockchain is a ledger that records bitcoin transactions. The blockchain is a distributed database that achieves independent verification of the chain of ownership. Each network node stores its own copy of the blockchain. Transactions will broadcast on the bitcoin network, and about 2400 transactions create a block. These blocks are building blocks of the blockchain. Mining is the process of dedicating computing power to process transactions, secure the network, and keep everyone in the system synchronized together. It has been designed to be fully decentralized. Miners need mining software with specialized hardware. Mining software listens for transactions broadcasted through the peer-to-peer network and performs appropriate tasks to process and confirm these transactions. Bitcoin miners perform this work because they can earn transaction fees paid by users for faster transaction processing. New transactions have to be confirmed then be included in a block along with a mathematical proof of work. Such proofs are very hard to generate because there is no way to create them other than by trying billions of calculations per second. Hence, miners are required to perform these calculations before their blocks are accepted by the network and before they are rewarded. As more people start to mine, the difficulty of finding valid blocks is automatically increased by the network to ensure that the average time to find a block remains equal to 10 minutes. As a result, mining is a very competitive business where no individual miner can control what is included in the blockchain. The proof of work is also designed to depend on the previous block to force a chronological order in the blockchain. This makes it exponentially difficult to reverse previous transactions because it would require the recalculation of the proofs of work of all the subsequent blocks. When two blocks are found at the same time, miners work on the first block they receive and switch to the longest chain of blocks as soon as the next block is found. This allows mining to secure and maintain a global consensus based on processing power. You have more chances if you participate with others to create a block. In a pool, all participating miners get paid every time a participating server solves a block. The payment depends on the amount of work an individual miner contributed to help find that block. A full node is a client that fully validates transactions and blocks. Full nodes also help the network by accepting transactions and blocks from other full nodes, validating those transactions and blocks, and then relaying them to further full nodes. Many people and organizations volunteer to run full nodes using spare computing and bandwidth resources. bitcoind is a Bitcoin client under the MIT license in 32-bit and 64-bit versions for Windows, GNU/Linux-based OSes, Mac OS X, OpenBSD and FreeBSD as well. Cryptocurrencies are replacement for banking we know today, and bitcoin is the game changer. Mining bitcoin with typical hardware is not a good idea. It needs specialized devices like ASIC, but you can create a full node and help the bitcoin network. The DRM Graphics stack from Linux is ported to FreeBSD on an ongoing basis to provide support for accelerated graphics for Intel and AMD GPUs. I read through some of the code that was defined in this file. Some of it was in functions, and other bits were in templates, but after a while, I figured that most of the code was a wrapper around a function called chdir. A lot of the functions defined in the cd.def file linked above actually just invoke chdir and handle errors and parameter cleaning.